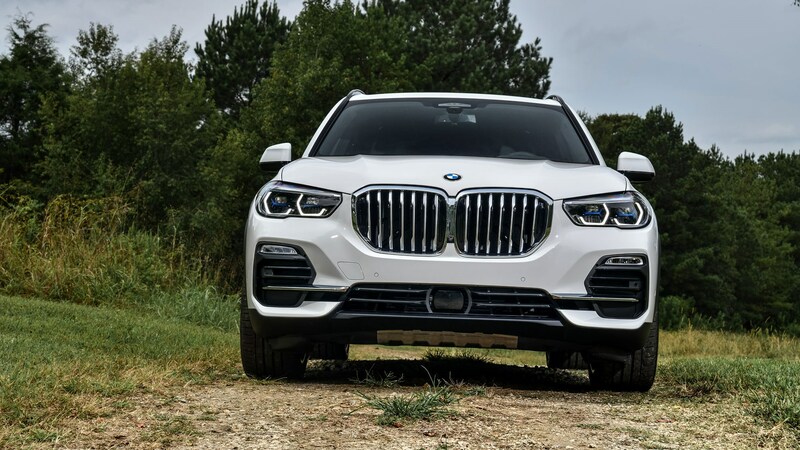 At the beginning of its life, the BMW X5 SUV was seen as a bit of a Marmite car - you either loved the lofty driving position and ability for light off-roading, or lamented the fact that BMW stepped away from just making sleek saloons. Now in its fourth generation, the X5 has spawned an entire series of other X cars below and above it now, too. It plays a critical role in getting buyers with high aspirations (and higher visibility goals) through the door, even if they drive away in a smaller model that offers most of the lifestyle image at a much more reasonable price. That means this new model needs to offer even more than before to keep customers out of an Audi Q7, Range Rover Sport, or indeed the cheaper cars that sit below them in the line-up. Fascinating. What engines can I get? From top to the bottom you’ll be buying a straight six – the most powerful is the quad turbo M50d, then there’s a 40i petrol (a real highlight for reasons we’ll explain later) and the projected best-selling 30d diesel. That’s because it’s ruthlessly effective and reasonably cheap to run. In operation it’s smooth and quiet until you stretch it, but there’s enough midrange torque that you shouldn’t ever experience its more vocal upper reaches. The petrol 40i is faster and much more refined, plus sounds more attractive at higher revs. Of course it’s also more expensive to run, but as it’s barely a handful of tenths slower than the M50d and substantially cheaper to buy, we reckon it’s a tempting offer unless you do huge monthly miles. Perhaps predictably a strong suit – because the BMW X5 is a great steer, as it turns out. It’s not the ultimate driving machine you’d instantly choose for picking apart a challenging road given its tall and heavy nature, but it manages to do all the muddy stuff you could ever need while still entertaining on the road. Air suspension (standard on UK cars) isolates potholes with ease and resists the pitter-patteriness often associated with such a set up admirably. It’ll be interesting to test it fully in the UK on our chopped up tarmac, however. Body movement is kept neat and tidy by active antiroll bars – there’s very little weight transfer to worry about in a series of corners. 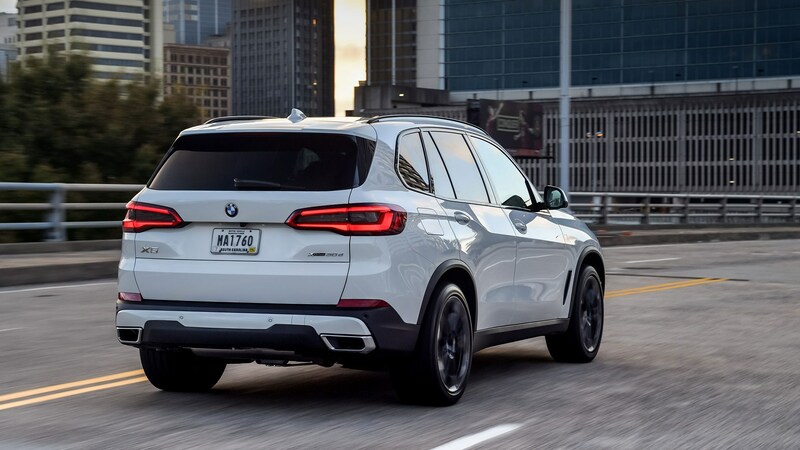 That means the all-wheel drive system can really shine, subtly shuffling power around and working in harmony with the rear-wheel steering to give the X5 confidence-inspiring stability. It always feels like there’s a bit more grip and a bit more lock to use if you bowl into a corner with abandon. Where the X5 falls behind saloon and estate rivals is that it doesn’t get exponentially more fun to drive as you approach its limits. You’re best driving it at three-quarters-effort where it’s happy to provide uncanny thrills – any faster and things get uncomfortable. There are two trim choices but BMW says 80% of customers will ignore xLine and pick M Sport – gaining 20-inch alloys, an M Sport bodykit and badges. 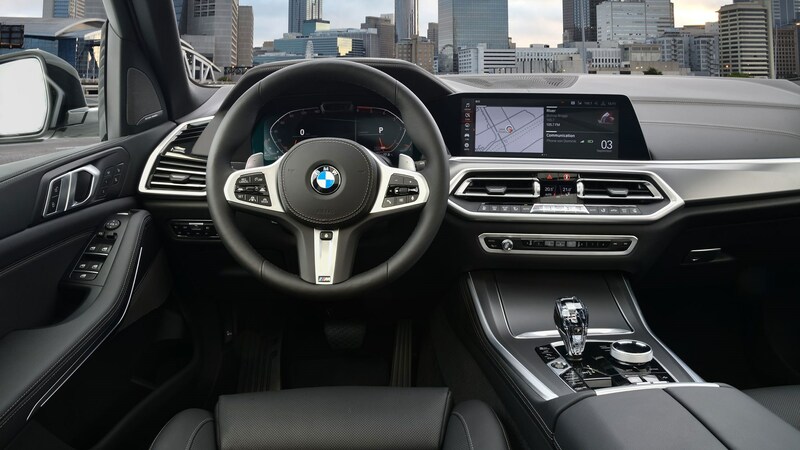 That may not sound like a lot, but that’s because the standard car is surprisingly well-equipped – automatic gearbox, all-wheel drive, air suspension, and BMW Live Cockpit Professional. The latter is the same dual 12.3-inch screen set up from the upcoming 8-Series and it’s very pleasing to the eye, but not quite as forward facing as the system you’ll find in a Mercedes-Benz, which looks like one long screen. 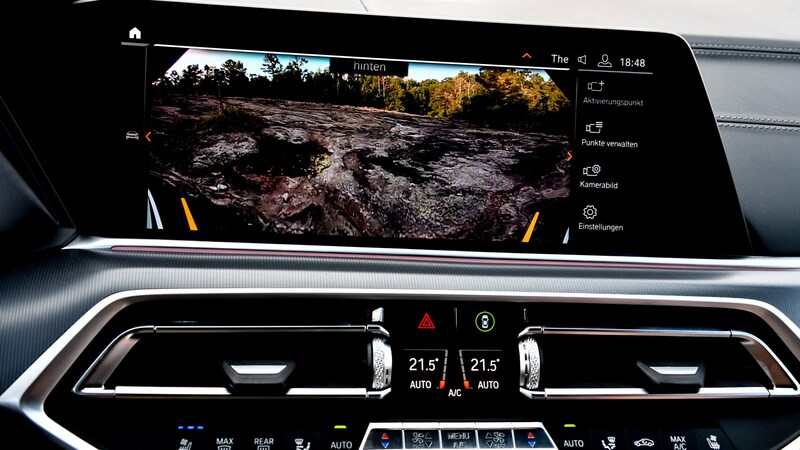 Because it’s 2018 the new X5 comes with all manner of cool driver assistance and connectivity tech – you can now programme your sat-nav from you smartphone and it’ll warn you about traffic and other delays on route to your next appointment even when you’re not sat in the car. You can also use your phone as the car key using the NFC chip, which BMW says is harder to hack than the standard key. Plus, you can send access to up to four friends, and because their BMW profile can be stored in the cloud, your X5 will automatically set itself up for them when they drive it. 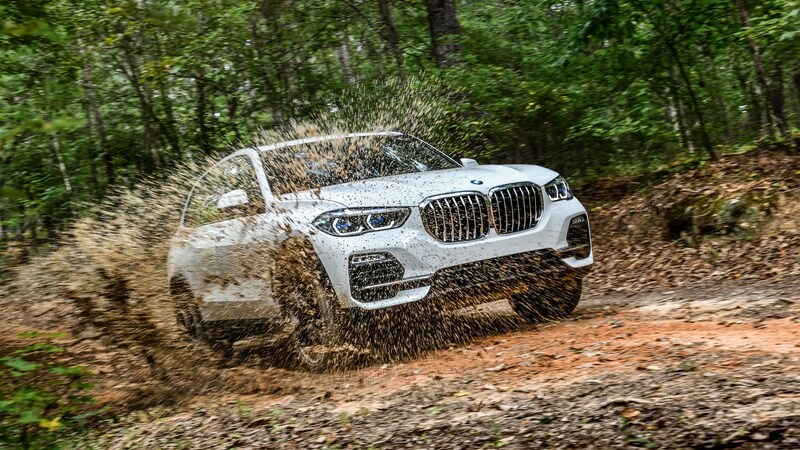 Key options include the M Sport Plus Package, which adds a load of styling upgrades and a Harman Kardon stereo, and the xOffroad Package to help turn your X5 into a proper mud plugger. This gets you a mechanical diff, sump guard, and off-road modes for xSand, xRocks, xGravel and xSnow. BMWs usual climate control panel of many buttons has been ripped out and replaced by a much more modern and decluttered centre console. You get knurled switches (like a Bentley!) and a crystalline gearshift (like a Volvo!) which brighten up and otherwise featureless fascia. To be honest we reckon the Audi Q7’s cohesive and brutally simple interior is still the benchmark here - but it’s fair to assume the newer two-screen set up from the A8 and Q8 will find its way in soon, which we don’t like as much. Then the comparatively simpler X5 will look all the more attractive. In the back you’ll find plenty of space for adults thanks to a low transmission tunnel and the 650-litre boot is usefully square, with minimal intrusion. You get a split tailgate as standard, which we’re not entirely sold on, but if you enjoy outdoor leisure activities then maybe this is a selling point. Whether or not you buy into the lifestyle image that comes with a large SUV like a BMW X5 is entirely up to you – we reckon a 5 Series Touring is a more satisfying drive most of the time and just as practical. 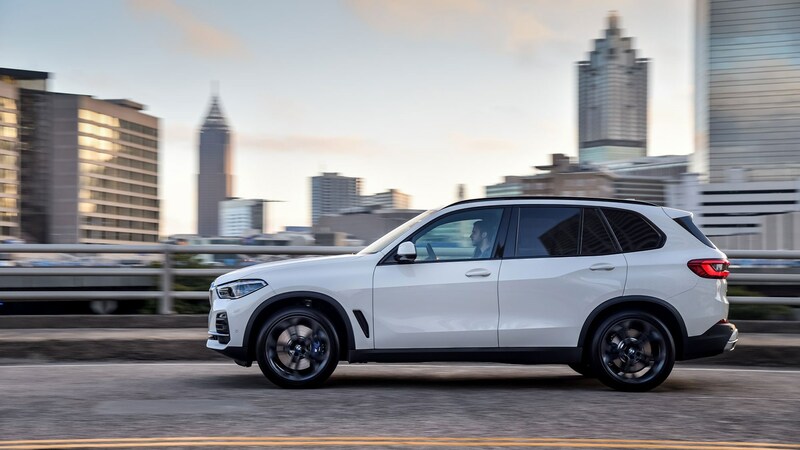 Thing is, as soon as you add any kind of rural hobby into the equation, or the desire to sit in a fashionably high-up driving position, the X5 starts to make more sense. It’s heartening then that this car closes the gap to its lower-flying stablemates in the driving stakes, and now offers even more tech and luxury.